The Keystone View Company was founded in 1892 by B. L. Singley in Meadville, Pennsylvania. 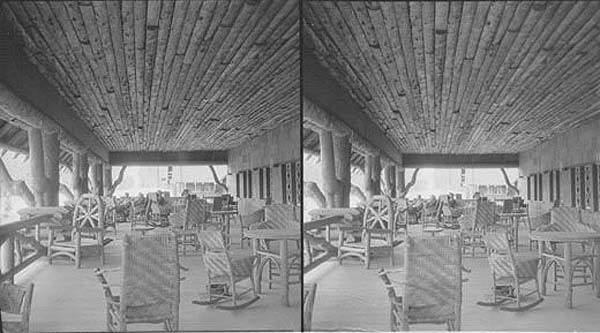 This might not sound like an auspicious location, far from the photographic centers of New York, Boston, and Philadelphia, and originally the operation did indeed have a "backwoods," quality, turning out distinctly second-rate stereoviews and barely making the founder a living. But it rapidly improved and eventually became not only the world's largest but also the best view company. In the formative days Singley took all the images; later there were dozens of staff photographers. Equally importantly, in the early 1900s, when stereoviewing was declining and other companies were in trouble, Keystone bought their stocks and incorporated them into their own holdings. Notable amongst many such purchases were the huge and varied inventories of B. W. Kilburn, the H. C. White Company, Underwood & Underwood. As a result, Keystone was said to have had some 2 million negatives by the mid-1930's. While this is likely a wild exaggeration they did have about 50,000 numbered views available. They developed the technique of consistently producing beautifully clear, crisp prints which were a delight to view; originally they were mounted on tan curved cards and later on their trade-mark dark gray curved mounts. The company also emphasized the use of informative text on the back of the views, and popularized the concept of boxed sets which had been innovated by the Underwood Brothers. By the 1920s the Keystone Company was the sole surviving major producer of conventional card-mounted views anywhere in the world. They had offices in London, Paris, Sidney, Capetown, Rio de Janeiro and Tokyo. 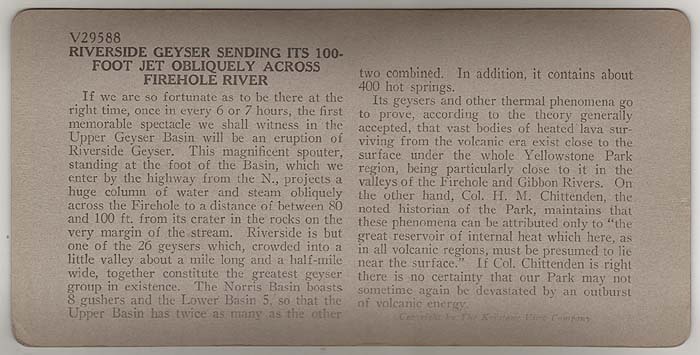 Part of this prominence was derived from the sale of World War I stereograph sets, as Keystone was one of the only publishers to secure permission to photograph battlefields and military operations. Unfortunately, permission was not granted until the end of 1918, just before Armistice, so many of the photographs depict scenes taken after the end of the war. As general interest in stereo dropped off with the advent of postcards, radio and movies, Keystone began emphasizing the educational value of their product and the use of stereo in the diagnosis and treatment of eye problems. The company survived into the 1970s, continuing to produce better and better views and viewers while public interest dwindled to a non-viable level, commercially. As one critic rather unkindly remarked, "Keystone perfected the buggy whip just as Ford began producing cars." When the company folded up their stocks lay for some time largely unguarded in the Meadville factory and were looted of some of the better images. The remaining ones eventually went to the California Museum of Photography in Riverside, California. There are many annoying problems for the Yellowstone collector of Keystone views. Often there are as many as eight or ten different negatives with the same number. Some of these are given to several negatives made at the same time. Others are for replacement negatives of the same scene, taken as much as eight years later. Still others bear no relation whatsoever to the original subject. There are certainly more variations in Yellowstone photos and titles than those listed here. 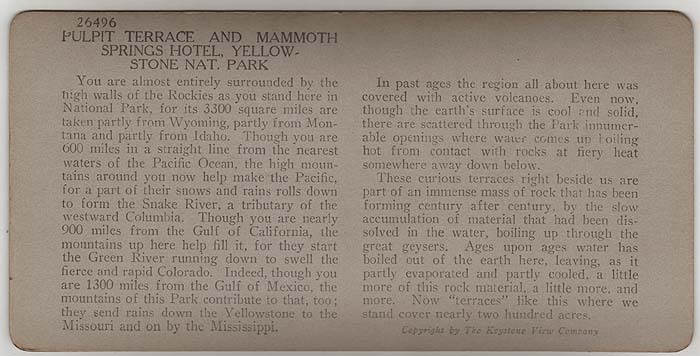 Yellowstone views began in 1897 on cream-colored regular sized mounts. Keystone continued to issue Yellowstone photos in boxed sets as late as the 1950’s. If the number begins with the letter V, the photo was originally an Underwood & Underwood view. If the number begins with the letter W, the photo was originally an H. C. White view. If the number ends with the letter T, the photo is part of one of Keystone’s “Tour of the World” sets. 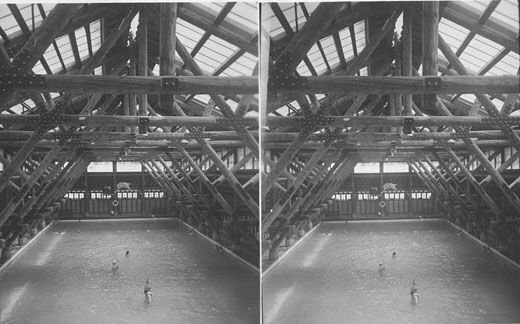 On some views a number will appear in the upper center of the stereograph. This is a “set” number. It is the position of that view in its particular boxed set. 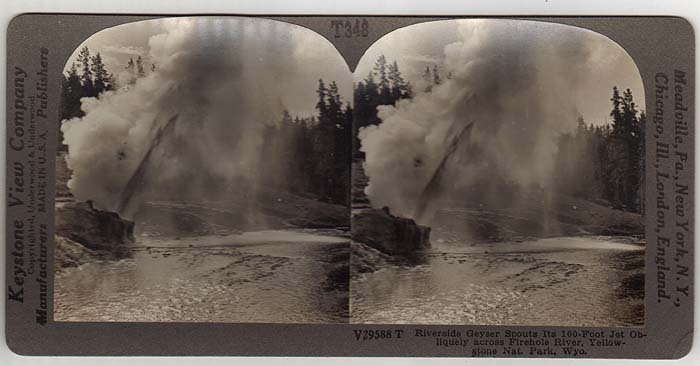 2447-Crater of the Oblong Geyser, Y.N.P., U.S.A. This 2000 series view is an example of the first Keystone style of Yellowstone view. It has the simple script design on the left side and a copyright date of 1897. The view shown is of Oblong Geyser Crater near the Giant Geyser Complex in Upper Geyser Basin. 2412-Grand Canyon of the Yellowstone, Yellowstone Park, Wyo., U.S.A. This tan mount 2000 series view is also an early one. The cities listed are only Meadville, Pa. & St. Louis, Mo. This view was probably issued around the turn of the century. 2450-Yellowstone Lake Paint Pots, Yellowstone Park, Wyo., U.S.A.
Another 2000 series style is this odd colored viewtype. This is a later view as evident by the large number of publishing cities listed. The image is of the Yellowstone Lake Paint Pots at West Thumb Geyser Basin. Much later the 2000 series views were still being included I Keystone boxed-sets. This gray mount 2000 series view of the Lower Falls is an example. Notice the number "32" shown on the reverse side. This was the view position in this particular boxed set; a 36 view set of Yellowstone National Park scenes. 10602-Looking Out from the "Golden Gate,"
Keystone’s 10,000 series are less common than most of their other views. They were only occasionally used in boxed sets and thus there overall printing was less. 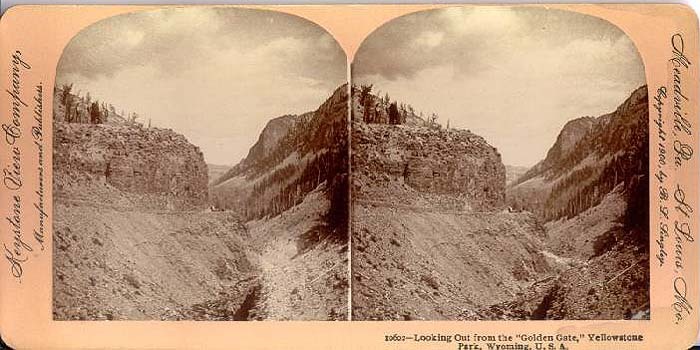 This image shows the Golden Gate Canyon near Mammoth taken from down in the canyon itself. Yellowstone National Park, Wyo., U.S.A. The 13,000 series views are quite common today. They appeared in many of the boxed sets. However this was only true for the gray mounts and not for the tans like this one. Another of the odd pinkish mounts, this 13,000 series view shows liberty Cap and the National Hotel in the background. 13588-Angel Terrace, Yellowstone National Park, Wyo., U.S.A.
A common gray mount from the 13,000 series. 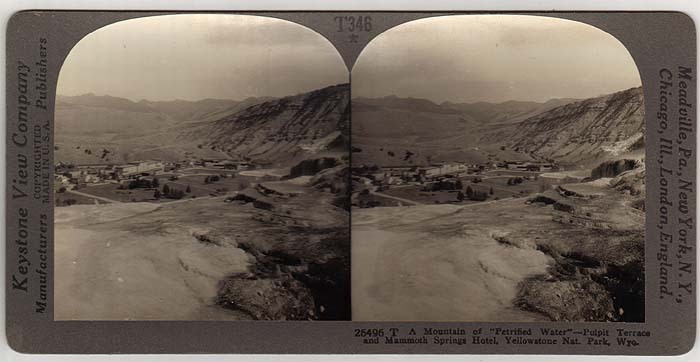 Its position in its boxed set is indicated by the "192" shown in the upper center of the stereoview. 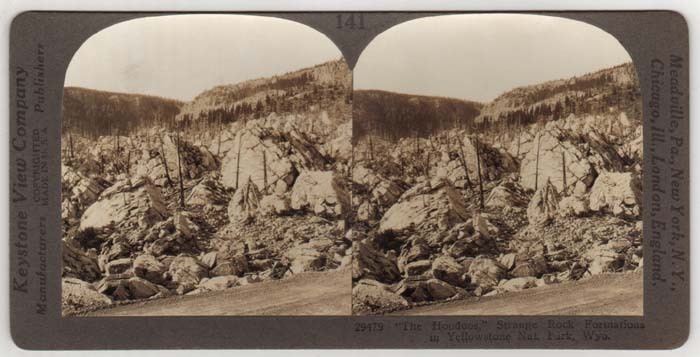 Views like this are perhaps the most common of all Keystone Yellowstone stereoviews. and Park Supt. Albright, Yellowstone National Park, Wyo. A rarer series is the 18,000 series of presidential views. They include a dozen or so photographs of President Warren G. Harding’s visit to Yellowstone in 1923. This one shows the president at Artist’s Point near Canyon. Grand Canyon of the Yellowstone Nat. Park, Wyo., U.S.A.
A common view of the Grand Canyon of the Yellowstone, this view is position "64" in its boxed set. The number is stamped on the reverse in the top-center. Another common Keystone 13,000 series view, this one comes from their United States boxed-sets. It is lightly stamped "169" on the reverse. 13581-Rocky Mountain Divide, Yellowstone National Park, Wyo. This view of a coaches on Craig Pass is a more obvious boxed set issue. Its number "195" is clearly stamped on the upper center of the view front. 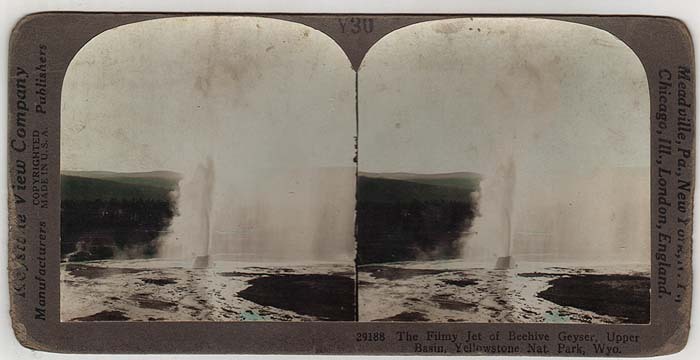 This gray mount view of Old Faithful is an original Keystone issue. It is not from a boxed set. Nowhere on the view are any numbers listed except for the primary Keystone number, 13584. 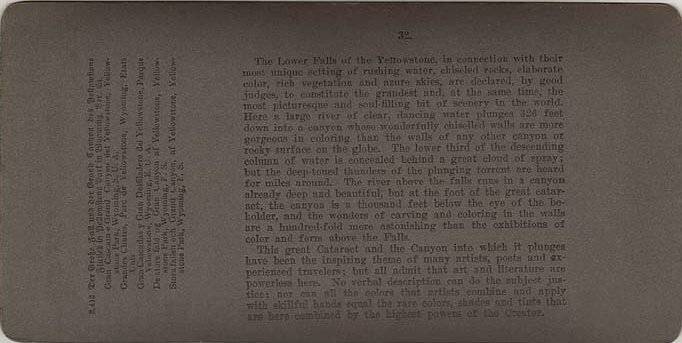 Here is rare example of a Keystone view that was purchased from the Underwood and Underwood Co. and still retains Underwood’s original negative numbers. Later Keystone issued their own numbers to these views, but for a short time they kept Underwood’s original numbers with the Keystone credit. The number "25" is from an Underwood boxed set and not Keystone. The reverse of the above view. It still credits Underwood and Underwood for the description even though the company no longer existed when this view was printed. A 26,000 series view of Ft. Yellowstone at Mammoth. This "Tour of the World" boxed set view is identified by the T346* in the upper center. The "T" stands for tour of the world and the * denotes one of the set printings. This odd 29,000 series view comes from Keystone’s Yellowstone boxed set. It is stamped Y30 on the upper front of the view. However the reverse of this view inexplicably has a 2000 series description still on it. Apparently the company felt that it was not necessary to update the reverse sides of views that were repeating photographs from earlier printings. A later Keystone issue. The number V29588T indicates an original Underwood & Underwood view (denoted by the "V"), and a "Tour of the World" boxed-set (denoted by the "T"). It is also stamped T348 on the upper front. This is its position in the boxed set series. in Yellowstone Nat. Park, Wyo. Yet another 29,000 boxed set view. This one is not identified on the obverse, but rather by the stamp "Y11" on the verso. It is position #11 in the Yellowstone boxed set. 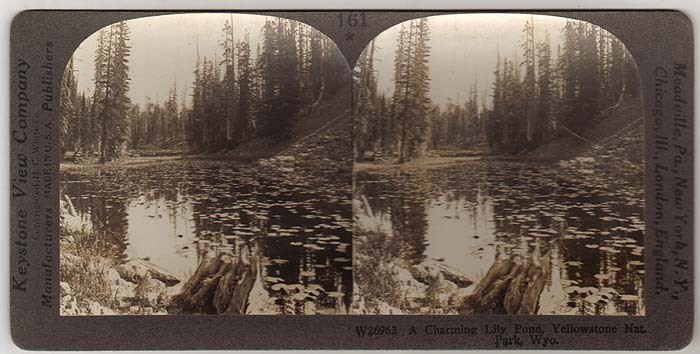 W26963 A Charming Lily Pond, Yellowstone Nat. Park, Wyo. This view of Isa Lake at Craig Pass is numbered W26963. It is actually an original view by H. C. White (as denoted by the "W"). It is also stamped Y35 on the reverse; its position in its particular boxed set. 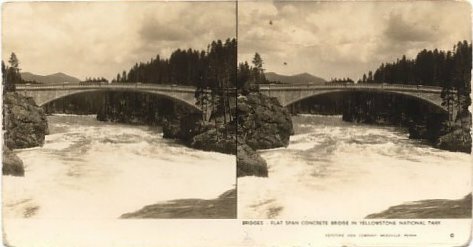 A rare Keystone bridge series stereoview. 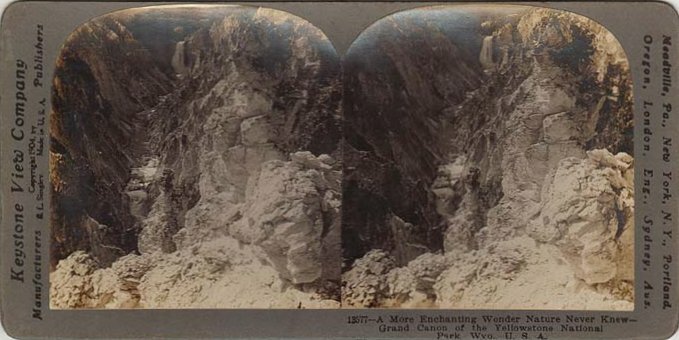 These were quite a bit smaller than regular stereoviews and included bridges from around the United States. This is the only Yellowstone view from that series. 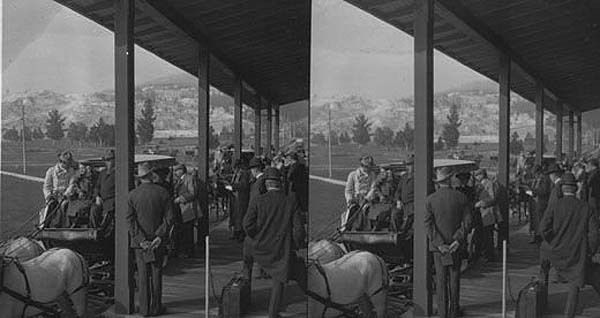 The following three images are from the Keystone Mast Collection in Riverside, California. They were printed from original Keystone glass negatives but never released to the public. There are dozens, if not hundreds of these views in the collection. 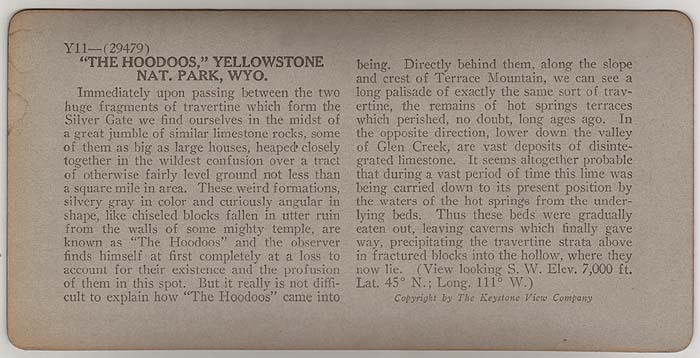 It is a shame that they were never offered for sale as they represent some of Yellowstone most interesting history.